Sound the alarm, it’s an eco-apocalypse! Manmade air pollution is destroying flower scent, frustrating bees, and threatening plant life. The entire ecosystem, or at least the decorative border in Grandma’s garden, could be on the verge of collapse. This unsettling prospect was based on a University of Virginia study funded in part by the National Science Foundation and publicized by the American Association for the Advancement of Science, solidly respectable institutions all. Does this mean we should be worried? Let’s take a closer look at the study. The fact that ozone and related air pollutants are highly reactive molecules is textbook chemistry. The fact that ozone destroys molecules commonly found in floral scent—such as linalool, beta-ocimene, and beta-myrcene—is also well known. Professor Jose Fuentes and two graduate students in the UVA department of environmental sciences looked at how these chemical reactions play out on a large scale. They claim that the ozone in polluted air drastically shrinks the distance snapdragons can broadcast their scent, potentially making it harder for honey bees to find them. This conclusion should be taken with a large pinch of salt. For starters, no flowers or bees or fragrances were observed in the course of the study. The entire project was a computer simulation, based on a hypothetical one cubic meter patch of garden containing exactly ten hypothetical snapdragon plants. Instead of measuring actual scent production, the research team keypunched in some estimates. And since one can’t measure wind and temperature above an imaginary garden patch, they input historical microclimate data from the university’s experimental farm. Computer modeling is a useful scientific method and there’s a certain digital elegance in blowing mathematically simulated pollution-laden breezes over virtual snapdragons. But in doing so the research team left out some basic biology. For example, the statistical air currents in Modelville, USA spread odors evenly through space, while in the real world of backyards and alfalfa fields scent travels in discrete plumes. (Light an incense stick outdoors and watch what happens.) Insects use the physics of odor dispersion to their advantage—they home in on an odor source by flying zigzag patterns back and forth across the plume. 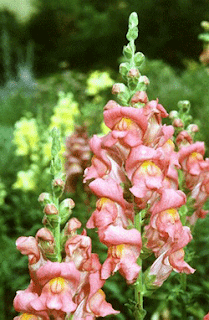 Here’s another difference: digital snapdragons in Modelville release a single, mathematically invariant scent; in the real world flowers vary the blend of their perfume. Fragrance chemists have time-sampled floral scents and find that the mix of components varies through the course of the day. Bees take this in stride and respond quickly to changes in a target scent. They have an impressive array of odor receptors and are better able to learn about smells than either fruit flies or mosquitoes. It’s more than likely they could find their way to snapdragons on a smoggy day. In any case, scientists would do well to test real-life bees on some living flowers before sounding the next eco-alarm. To be fair, Professor Fuentes and colleagues were careful to label the bee theory as speculation. The folks at the UVA press office weren’t so restrained: they stated flat out that air pollution was “inhibiting” the ability of insects to find flowers. The world media took this more vivid but less accurate summary and ran with it. Science relies on skepticism. Without it, experimental results go unchallenged, theories go unquestioned, and speculation runs rampant. The sounding of an ecological alarm is no reason to suspend skepticism. Some scientific scenarios just don’t pass the sniff test. In the case of Professor Fuentes’ flowers, just ask yourself: who are you going to believe, a computer-based Lagrangian diffusion model or your own lying nose?